This is an introduction to the Africa Web TV’s new team. 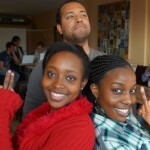 This is the team that will guide you through the 2nd chapter of the Africa Web TV’s story! With this team we are aiming for even greater things. Come and join the ride! Previous Previous post: Is modelling compatible with God?